Airtel is pushing big on content. After aggressively getting into music and movie streaming businesses with Wynk Music and Wynk Movies, the mobile carrier on Tuesday announced the launch of Wynk Games. The app is currently in the beta phase and offers a library of over 2,000 global and local games across genres. Wynk Games, which is available for download on Android smartphones and tablets from company’s website, serves as a platform for hosting games from several popular game houses including Reliance Big Entertainment, Hungama, Square Enix, Zeptolab, Thumbstar, Tresensa, Bulkypix, and Nautilus Mobile. Some of the popular titles include Chhota Bheem And The Throne of Bali, Chhota Bheem Jungle Run, Real Cricket, and Real Steel. The home screen of the app offers three panes: Trending, Latest, and Categories. Categories section allows users to look into their preferred genres such as Cricket, Racing, Role Playing, and Strategy & Simulation. The Latest section, as you would imagine shows the latest addition to the platform, while the Trending section gives you an idea of what other users are liking. Much like Wynk Music and Wynk Movies, Wynk Games is also ad-free and subscription based. 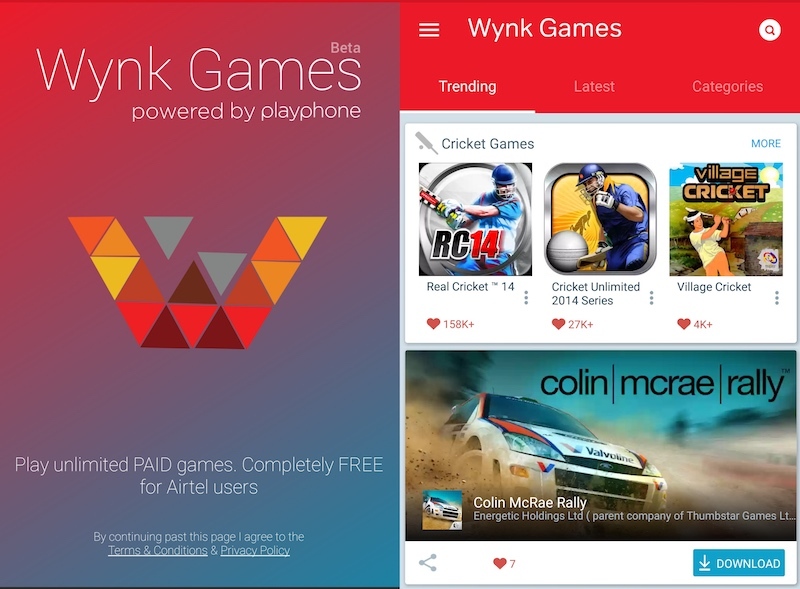 The company is currently offering Wynk Games’ subscription for free with Airtel Internet data packs. Users on other carriers can avail a subscription at a promotional Rs. 29 per month. These games can be played for free on offline mode as well. For Wynk Games, the company noted, it tied with Playphone, a decade old mobile social gaming network. The company adds that through its partnership with Playphone, Indian game developers will be able to expand their reach. The company adds that is it very easy for developers to turn their apps to make it suitable for the subscription based platform. All they need to do is add 10 lines of code.